For all dietetic and foodservice management courses covering topics such as procurement, financial management, quantity food production, human resource management, and leadership. 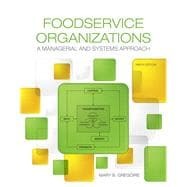 Applicable to a wide range of courses, including food production, management, leadership, and human resource management, this Ninth Edition of Foodservice Organizations: A Managerial and Systems Approach continues to use its unique system model as a guiding framework for understanding foodservice management. Originally developed by Dr. Allene Vaden, the foodservice systems model remains innovative and has withstood the test of time. With its detailed discussion concerning how to transform human, material, facility, and operational inputs into outputs of meals, customer satisfaction, employee satisfaction, and financial accountability, the basic principles of the text are applicable to a wide variety of programs. Within the text, theory and empirical research are seamlessly blended with practice and practical applications. The Ninth Edition includes updated and revised information on sustainable practices, process improvement, strategic management, leadership development, food safety, and current trends.